Hornet (Vespa crabro) predating solitary wasp. Surrey, UK. 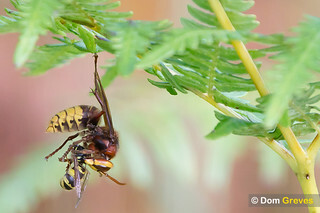 After locating this wasp sheltering under a bracken frond the hornet turned upside down and began to comprehensively disassemble its unfortunate prey.